The Multiple-Unit Pellet System (MUPS) tablets are a kind of multiparticulate system that has become an important and successful dosage form for immediate or modified drug release. These Multiple Units are composed of tablets containing uncoated or coated pellets allowing modified drug release. There are some advantages of these systems when compared to simple tablets or capsules such as the reduction of irritation of the gastric mucosa due to drug degradation of simple units as well as the improvement of dose adjustment. It also offers the possibility to administer incompatible drugs due to the multiparticulate system [1,2]. MUPS Formulation Factors: Pellets that are included in MUPS tablets can be uncoated or coated. 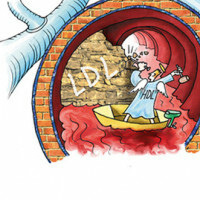 The drug may be included in the core or as a layer applied to the inert core of the pellet. In addition, the pellets may have one or more layers that may include suitable excipients for modified release such as polymers for enteric coating or polymers for sustained release. Uncoated pellets are made of suitable pharmaceutical excipients such as lactose and microcrystalline cellulose (MCC), among others. Coated pellets must be produced with the appropriate polymer and amount to form the coating film. Strength, ductility and thickness properties of the polymer will influence the rupture and deformable capacity of pellets when tableting. In addition, the stability of the pellet's coating film depends on compression forces applied [1,2]. Most studied polymers used to create the pellet's coating film are cellulosic and acrylic polymers. The advantages of acrylic polymers are the flexibility and adequate features that enable the tableting process without rupturing of the pellet's coating film. Combining two types of these polymers improve the coating film flexibility which is desirable for coated pellets elaboration, as well as the addition of a plasticizer in a certain proportion . Another important issue that influences drug release from MUPS is the pellet core. Pellets porosity of both, uncoated and coated pellets, affect the modified drug release profile. Pellet core design should be carefully studied previous to formulation. The excipients and binder liquid used to produce the pellet core may affect the deformation and viscoelastic properties of the pellet during compression, and thus cause changes in drug release profile . The use of other components like carrageenan polysacharide in the production / manufacture of the pellets, allows them to have a rapid disintegration and therefore a fast drug release [4,5]. MUPS Manufacturing Process: The manufacturing process of these tablets is tough and constitutes a challenge when considering all the steps involved in the process. The manufacturing process of coated pellets can be divided into two steps, pellet manufacture and tablets containing pellets manufacture. In fig. 1, both processes are described. First, the drug-pellet manufacturing process begins with the blending of pellet components such as drug, cushioning excipients like microcrystalline cellulose, Glyceryl Monostearate (GMS) and Lactose Monohydrate (LM) which are widely used in this kind of formulation. A binder liquid must be used (water or glycerol) for wet mixing. The mass obtained continues through the extrusion-spheronisation process and the drying of pellets recently formed can be performed in a fluid bed dryer. The next step, pellet coating, requires a careful selection of the excipients that will form the coating film in order to obtain the desired drug release . The tableting process will be performed by a rotary tablet press machine and tableting parameters like main compression force or speed constitute important issues that will be mentioned later. Pellets and cushioning excipients will be added for tableting, taking into account the excipients' adequate properties in order to withstand high compression forces. Tablets containing pellets with specific features of shape, weight, thickness, and hardness then continue through the tablet film coating process. The tablet film coating is applied to improve the stability and appearance of the pharmaceutical composition, and has no significant influence on drug release upon tablet disintegration, as it is one of the functions of pellet coating film. One of the main problems observed in the manufacturing of modified release MUPS is that the compaction process of pellets to obtain the tablet can cause the breakdown of the polymer coat and alters the mechanical properties and release rate of the drug from the pellets. Therefore, the optimization of the pellet formulation to prevent pellet deformation during compaction may be critical [1,6,7]. To overcome this problem, cushioning agents, such as polyethylene glycol among others are commonly used [7,8]. Drug Release: Usually the multiple unit pellet systems (MUPS) are designed to obtain a modified release profile of drugs. This modified release should be con­sidered as delayed release or sustained release. The delayed release can be achieved, for example, by enteric-coated pellets. Enteric-coating allows that active pharmaceutical ingredients that are unstable in gastric media or may cause gastric irritation are protected by an enteric coating. Methacrylic acid copolymers, Hydroxypropylmethylcellulose phthalate, and Hydroxypropylmethylcellulose acetate succinate are enteric-coating polymers frequently used for this function. MUPS tablets containing sustained release pellets will achieve sustained action and prolong the pharmacological effect, extend the dosage interval and reduce side effects. The use of pellets coated with different polymers and different film thicknesses that allow modulation of the release rate from pellets. The polymers used can be, among others, cellulose derivatives such as ethyl cellulose and hydroxypropylmethylcellulose (HPMC). 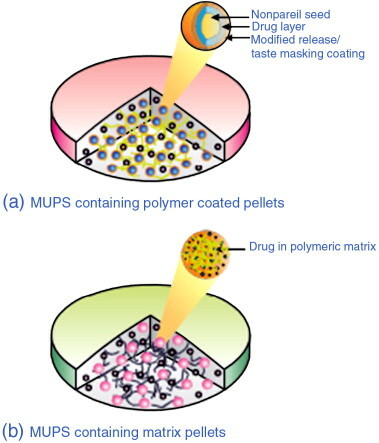 The use of uncoated pellets as a matrix polymeric system for sustained release of the drug. In this group the hydrophilic matrix systems based on the use of cellulosic polymers, carbomers or xantham gums, among others are frequently used. Numerous factors related to the physicochemical characteristics of the drug, type, percentage and other characteristics of the polymer and formulation factors can affect the release rate from these systems [9,10]. MUPS Applications: The MUPS technology is used successfully as an alternative to conventional tablets. Enteric coated pellets containing different drugs and packed into tablets are commonly used to protect drugs from gastric media. It has been shown that Omeprazole MUPS have increased bioavailability and improved pharmacological response . Another important application of the tablet is in the field of sustained release with different drugs such as diclofenac, theophylline, metoprolol and pseudoephedrine among others [2,9,12]. In conclusion these tablets are an interesting alternative for modified drug release for oral administration.